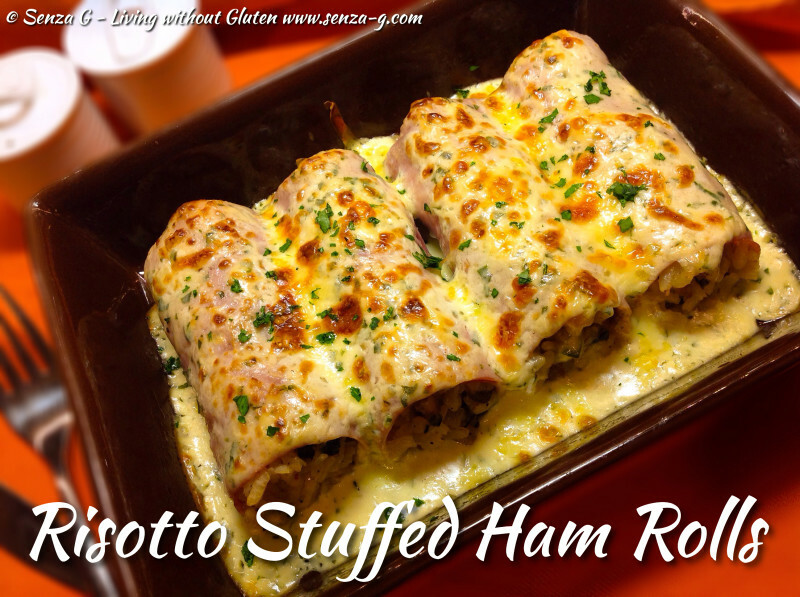 These Ham Rolls are absolutely delicious and make a change from the usual baked pasta or risotto. Once you make the risotto than it is a breeze, just assemble everything and pop in the oven ! I prefer making them in individual dishes as they look better served this way. I had some leftover risotto and decided to turn that into a frittata the next day. I added some more cheese and a few beaten eggs. So yummy! Remove the casing from the sausage and break up the meat. Sauté the onion in a little olive until translucent. Add the sausage and cook until browned. Add the sliced mushrooms. Add the rice, stirring until it is covered with the oil. Pour in the wine which will be absorbed almost immediately. Stir in the minced garlic and add a ladle of stock. As soon as the stock looks almost absorbed, add another ladle. Continue adding a ladle at a time till the rice is nearly al dente. Throw in the spinach leaves, combine with the rice till they wilt. Add the parmesan cheese and a knob of butter. Stir well until the butter melts in the rice. Season, cover and leave to cool slightly before adding the beaten egg and more Parmesan Cheese if desired. Pour the panna into a small saucepan and heat over a low flame. Add both of the grated cheese, the nutmeg, parsley and season. Heat until the cheese melts but do not boil. Set aside. Lightly grease two individual ovenproof dishes. 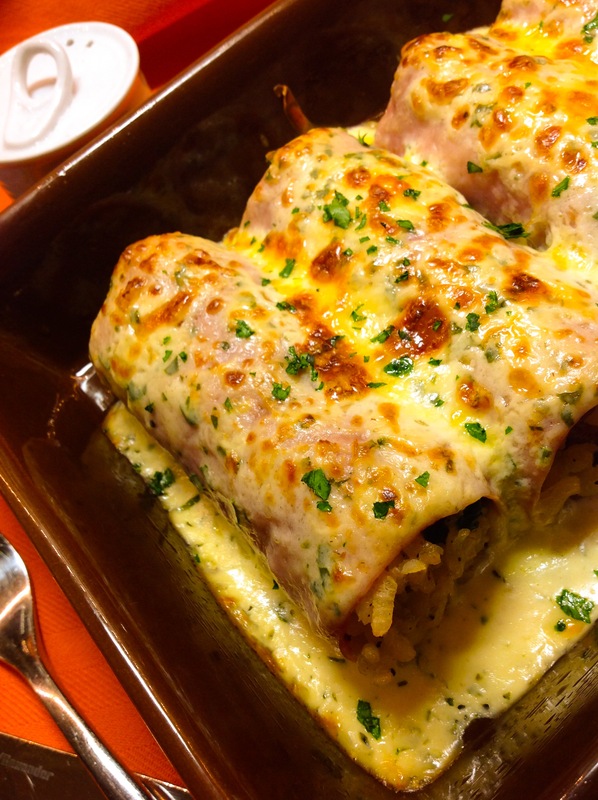 Place a couple tablespoons of the cheese sauce over the bottom of the dishes. Set aside. Place the ham slices on your worktop. Place tablespoons of the risotto at the bottom end of each roll, forming into a sausage shape. 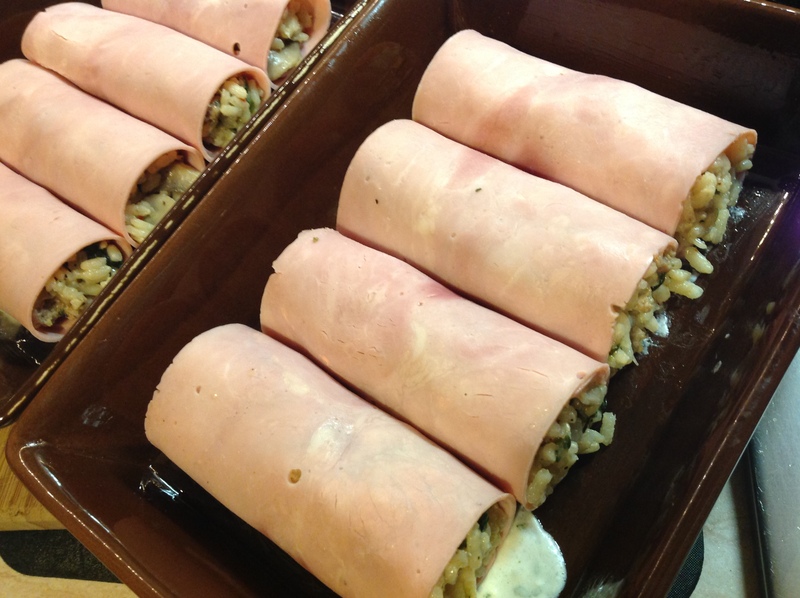 Roll up each ham roll and place seam side down in the ovenproof dishes. Pour the cheese sauce over the top of both dishes. Sprinkle the top with grated cheddar. 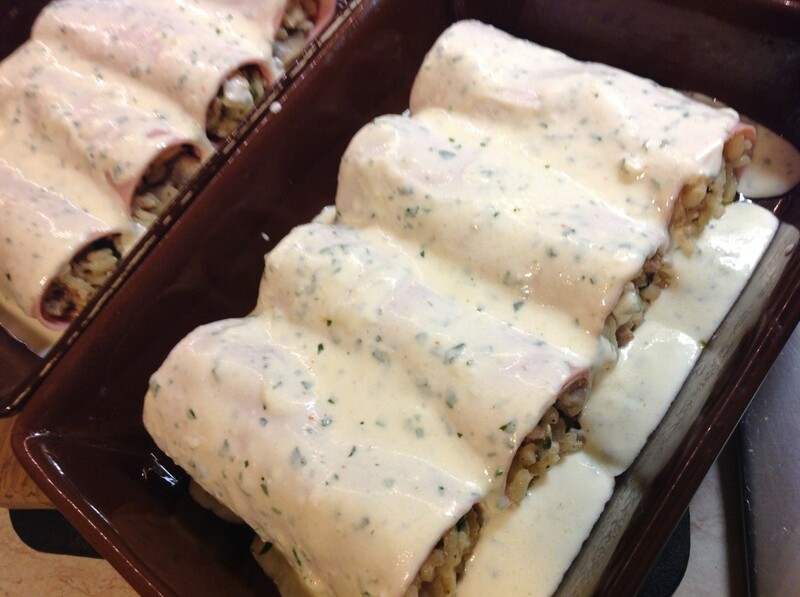 Cover both with foil and place in the oven for approximately 30 minutes. Remove the foil and turn to grill to brown the top slightly.